How do KBF Judges do it? KBF event competitors are familiar with the TourneyX user interfaces on smart phones and computer monitors, but what does it look like in the administration side? What are the judges doing with each photo as it’s uploaded? 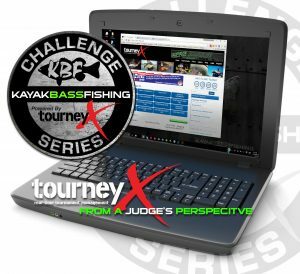 This is where the power of TourneyX becomes apparent, Dwayne Walley has provided judges with a wide assortment of tools that we use to accurately, objectively, and impartially score the photos submitted for each KBF Challenge and Tournament. These tools reduce opportunities for mistakes and fraud, and they dramatically speed up the time it takes to judge events and post results. 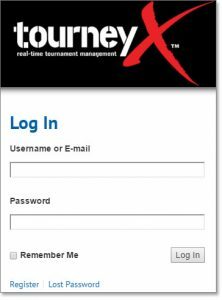 Not only is TourneyX evolving and continually improving, but Dwayne and his team are working on a TourneyX app that will make the competitor’s processes a lot easier and faster. We hope to see these by next year’s tournament season and be using this powerful app in the 2017 KBF National Championship. Below are screen grabs with commentary that will help you understand what takes place behind the scenes to ensure KBF competitions are conducted fairly. Each event organizer provides his judges a username and password to get in the tournament director’s account, where they will have access to the administrative tools for all events created by that account. For security, TD’s are encouraged to change their passwords each month so that only the KBF members tasked with judging active events have access. Note: Club officers, event organizers, and tour directors contact TourneyX in order to create a director’s account and create a competitive event. This requires that the organization set up and link to its own PayPal account or use an existing one, because sign-up fees go there, and its from there that they usually pay the user fees to TourneyX. Look at tournament leader boards, add competitors, and activate them so they show up on the public view and can see the event in their own dashboard. Send emails to individual competitors or to everyone registered for an event. This is useful for weather alerts and for rules and logistics clarifications and updates. 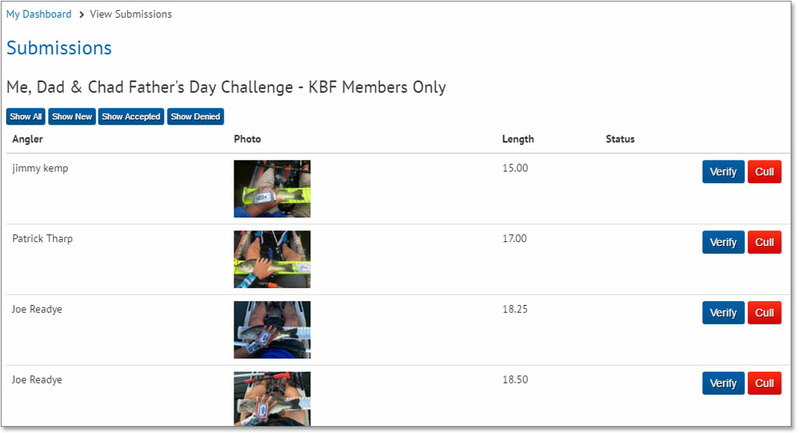 Manually upload photos to assist competitors who were unable to submit them on the water. Purchase blocks of events. The TD has two options: set up an event and pay TourneyX a $5 per person as a user fee, or purchase one or more tournament licenses for a set. Based on the number of registrations he anticipate, the TD usually opts for whichever provides the lowest cost-per-competitor. Notice the blue-highlighted text above the function buttons. If a competition is active, that box appears, and if there are any photos that require action, a note to that effect with the number of photos in queue will display. 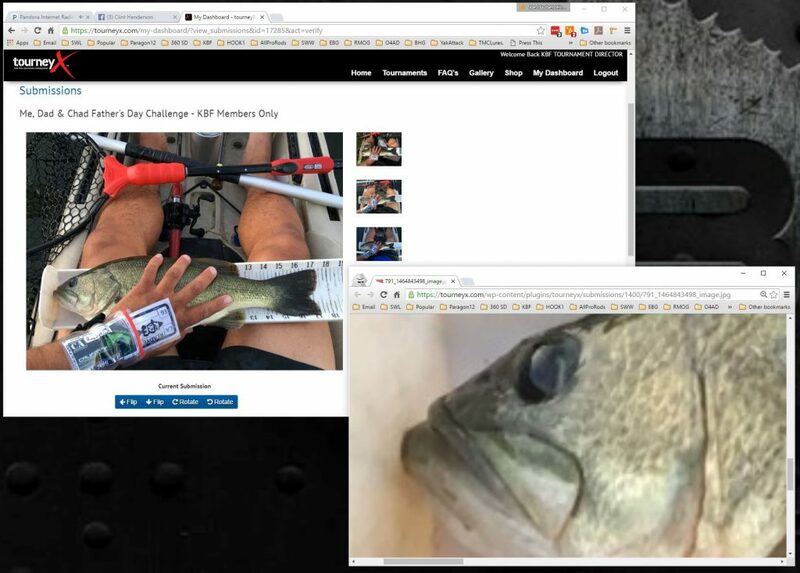 The Submissions Page presents a list of anglers with thumbnails of the photos they submitted, the length suggested by the anglers, and a couple of buttons. One button (“Verify”) doesn’t mean the photo and length are accepted but will open a details page that the judge will use to examine and pass judgment. The other button (“Cull”) is useful when a photo must be rejected immediately. For example, an angler may upload multiple copies of the same photo if he is in doubt whether his submission got through or not. A judge is able to tell by just the angler’s name, photo thumbnail, and length that this has happened and can dump the duplicates. It can also be used to quickly remove submissions by someone who has been disqualified from competition. If a photo must be denied due to a rules infraction, that is done at the Verify step, below. To proceed, just choose a submission to judge, make a mental note of the length, and click the blue “Verify” button. If the camera was sideways or upside down when the photo was snapped, the photo can be rotated 90 degrees with each click of the “Rotate” button. This not only makes it a little easier to judge, but the image will be properly oriented in the leader board, too. Note: “Flip” buttons create mirror images. It’s probably best to avoid these unless, somehow, the angler has created a mirror image for submission. We have no idea what useful purpose this function serves, but there it is. The angler’s phone number is very useful. If a photo is blurry or other rules infraction is apparent, the judge may, at his discretion, text or call an angler to ask questions, request clarification or suggest that this photo be culled and an alternative photo be submitted. Judges are not required to do this, but sometimes communicating with the competitor helps ensure the fairness of the process. 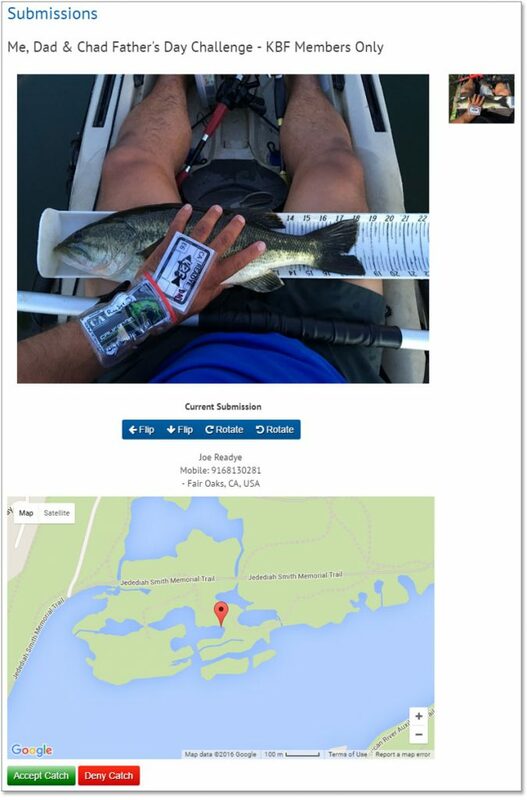 If the competitor has allowed TourneyX access to the smart phone’s location, a map showing where the angler was when submitting the photo will display. At this point, the judge either accepts the photo or denies it by clicking the appropriate button. He can modify the length, apply penalties, and add comments at the next step. Judges may find they need a larger view to make sure of details, like whether the jaw is in contact with the Hawg Trough fence, how wide open the fish’s mouth is, and exactly how far the tail reaches. The images on this detail page are all hyperlinked to larger images. Just click the photos and a larger image pops up. For a closer look, one way to magnify is to use the browser’s “Zoom” feature. Hold down the “ctrl” or “Control” key and roll your mouse wheel, or use a touch-pad’s two-finger pinch or spread motion to change the browser magnification. Chrome browser offers a nice right-click menu option: choose “Open link in incognito window.” This opens the image in its full size (usually larger than simply clicking the image on the TourneyX page), and when you zoom in on the incognito window, it leaves the regular browser windows unchanged, at its original magnification level, as shown in this image. After the judge has reviewed the details and has decided how to proceed, he clicks one of the two buttons at the bottom of the page. When he does so, the page expands with the appropriate fields. If he clicks “Accept Catch,” he can adjust the length or leave it as the angler entered it. If he reduces the score for a rules infraction, the judge explains what rule applied and why the deduction was made. He may also suggest the angler cull this photo and submit another of the same fish with a close mouth, unpinched tail, more in-focus, etc. The last step in verifying a photo is to click the “Verify Submission” button. Then he waits…. and waits… and waits….. There’s a whole lot of processing power at work here, so the judge usually has twenty or thirty seconds to kill waiting for the Submissions page to reappear. This is a good time to stretch, rest one’s eyes, get a cold drink, or check emails. Processing time is one reason judging takes a while, but even there this is a LOT faster than the old way. Almost all KBF judges fish competitively and understand how difficult it is to catch and submit compliant photos under the stresses of competition, adverse weather conditions, intermittent connectivity, and especially when the adrenaline rush of catching a big fish is making the camera hand shake. Because we’ve all been there ourselves, we give the competitor every break we can. Whenever possible, a judge prefers to deduct length for rules infractions rather than eliminate the fish entirely. However, sometime judges have no other option than to deny a catch. Like when, unbeknownst to the competitor, he caught and submitted the same fish earlier in the day. Or his photo was just too blurry to evaluate. Or the fish’s jaw was clearly not touching the Hawg Trough fence, the mouth was open more than a half inch, or the tail is lifted off the measuring board. See the KBF Rules page for a list of conditions that will DQ a submission. In those cases, the judge clicks the red “Deny Catch” button and a “Choose Reason” field opens. This is where the judge explains why the photo was rejected and may request a substitute photo. Whether he makes that request or not, upon receiving the verification email, the angler may scroll through his photos and, if he has a more suitable one, resubmit the fish as usual for evaluation.